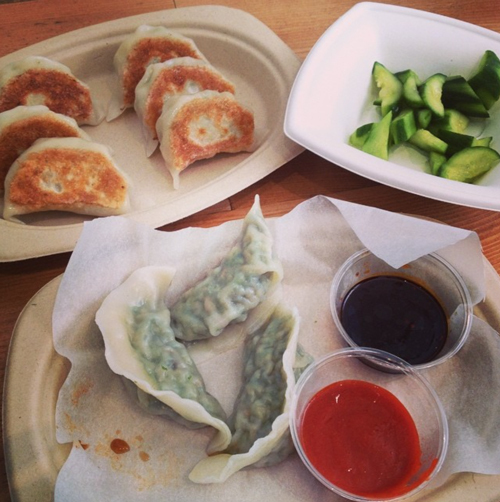 There’s no shortage of delicious dumplings in NYC. But happily, there’s a new place specializing in quality dumplings – pasture-raised meat from Fleishers, organic vegetables – in an airy, tranquil space in the East Village, home of the singular ingredient restaurant (see: Empire Biscuit, The Nugget Spot, Pommes Frites). Mimi Cheng‘s is run by two sisters, Hannah and Marian, named in honor of their mother, and you can watch the dumplings being stuffed, folded and pleated in front of you. It’s a simple menu: pork, chicken or vegetable dumplings (yes, there’s kale in the latter), served boiled or potsticker style, plus a daily side vegetable and dessert dumplings. If you happen to be there on the day the Taiwanese cucumber salad is the daily side, order it, because it’s cool and crunchy and very refreshing. Leave room for the Nutella and banana dessert dumplings, because this cute gimmick shouldn’t work but does, since warm Nutella and banana is always a good idea. Mimi Cheng’s, 179 2nd Ave.
More: Dumpling Party with Mimi Cheng’s on Tasting Table.